The crisis-ridden Peoples Democratic Party, PDP faction of Alhaji Ahmed Makarfi faction may have concluded plan to sell off the party to the highest bidder in it quest to raise fund to finance the party. Being the biggest faction of the two factions fighting for the soul of the former ruling party as it has the support of an overwhelming number of former governors, ministers and power brokers, however suffered a major setback at the courts recently when the other faction led by former Borno State Governor, Ali Modu Sheriff, was declared as the authentic executive of the party. The Makarfi faction has however, challenged the decision of the Court of Appeal at the Supreme Court. Among those who are said to have received it are former President Goodluck Jonathan; a former Chairman of the Board of Trustees, Chief Tony Anenih; and a former National Security Adviser; Gen. Mohammed Gusau (retd.) Some other members of the BoT and the national caretaker committee have also collected copies of the document, sources say. The report, which was seen by our correspondent during the week, groups the party’s membership into six categories in descending order of members’ financial contributions. Those in the highest categories are to have special benefits based on their financial contributions to the party. The categories are: Platinum, Diamond, Gold, Silver, Standard and Students in Tertiary Institutions. According to the report, male members of the party who desire to be Platinum members are to pay N500,000 a year or N50,000 monthly instalments while women are to pay half the amount. Members in this category are also to contribute and participate in the formulation of key policy decisions for the next general election. “Consideration shall be given to platinum card-carrying members for appointment into boards of Federal Government-owned parastatals, agencies, ministerial appointments as well as other benefits that accrue to the party,” the report says. For those in the diamond category, they are expected to pay N250,000 (men) or N200,000 (women) annually to the party. The document also states that diamond card-carrying members will enjoy most of the privileges associated with those in the Platinum group. Gold card members will be expected to pay N200,000 (men) or N100,000 (women) minimum a year. They are expected to enjoy the benefits accruing to those in the diamond card category. Holders of Silver cards in the party, according to the document, are expected to contribute N100,000 (men) or N50,000 (women) per annum to the party. But they will not enjoy contracts from the government or be allowed to contest for national offices or be considered for appointment as ministers. However, Silver members may be considered for commissionership appointments as well as other benefits that may accrue to the party such as “procurements, contracts and projects” at the state levels of the party’s governance structures. Members who cannot afford to part with the sums quoted above will be asked to cough out N3,000 (men) and N2,000 (women) annually. However, they will only be allowed to contest for public posts at the local government and ward levels. Those in this category are called “Standard membership” card holders. In his reaction, the National Chairman of the party, Senator Ali Modu Sheriff, said the cash-for-membership plan would not work, adding that the party was not for sale. Sheriff added that the plan of the Makarfi-led caretaker committee was to handover the party to the rich. Speaking through the Acting National Publicity Secretary of the party, Mr. Bernard Mikko, the former Governor of Borno State said, “That idea won’t work. We are talking and planning to handover the party to the people, yet some people are secretly planning an alliance to hijack it. Deputy National Chairman of the PDP, Dr. Cairo Ojougboh, also condemned the new membership plan. “The committee should stop misrepresenting us. It is going about dishing out the report to eminent members of our party without authorisation,” he said. But the spokesperson for the Makarfi faction, Prince Dayo Adeyeye, disagreed with the critics of the new plan, saying that it would be wrong for anyone to say that the committee was not serving the interest of the party. Interestingly, the party’s thinkers would still like to have a situation where government funds political parties. In the report, the Gana-led committee said the Federal Government should continue to fund political parties. It said, “It has been established that political parties all over the world are funded by governments of their various countries. This was also in practice in Nigeria before a PDP-controlled National Assembly stopped it. The committee further recommended that the party should invest five per cent of its annual income in commercial companies. In order to make more money, the committee said the party must establish companies that would bid for contracts as well. The report said, “It is recommended that five percent of the party’s income be invested in reputable fund managers and blue-chip companies such as pension funds, treasury bills, bonds, telecommunications companies, oil companies etc. NEC should determine such companies from time to time. Seven political parties reportedly in merger negotiation with the opposition Peoples Democratic Party (PDP) ahead of 2019 general elections, News Punch understands. Though names of the parties are yet to be disclosed, but our source revealed that that Labour Party (LP), Peoples Redemption Party (PRP) and Social Democratic Party (SDP) are among the parties PDP might be forging an alliance with. About two weeks ago, Chairman of the PDP Strategy Review and Interparty Affairs Committee, Prof. Jerry Gana, met with the SDP leader, Chief Olu Falae in Lagos. PDP National Publicity Secretary, Prince Dayo Adeyeye, confirmed the meeting later at a press conference. A source, who confided in our correspondent yesterday, said that PDP and PRP met penultimate Saturday and have raised a six-man Contact Committee each, for further negotiations. “Professor Jerry Gana will head the PDP six-man committee, while the National Leader of PRP, Alhaji Balarabe Musa will head his party’s team,” the source confided in New Telegraph. Although details of the maiden meeting, which held in Abuja about 12 days ago, remain sketchy, the source said that PRP had insisted on an alliance and not a merger because it wants to maintain its unique pro-masses ideology. When contacted, Balarabe, a former governor of Kaduna State, confirmed that a meeting between his party and PDP actually held, but didn’t divulge the details. The chairman, National Caretaker Committee of the PDP, Senator Ahmed Makarfi, was specifically mandated to get across to Balarabe in order to sound him out on the possibility of working together. It is still not clear what kind of alliance will exist between PDP and PRP, but another source said that the working relationship is aimed at making inroads in the North, the stronghold of the All Progressives Congress (APC). “In spite of the failure of the APC-led government, the masses still love President Muhammadu Buhari. Balarabe and PRP are also very popular in the North, so we intend to slice into Buhari’s heartland,” he revealed. 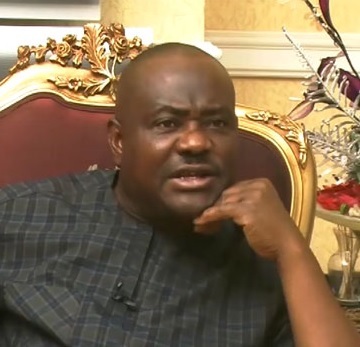 PDP had maintained that it is not part of the rumoured mega party and does not want to change its name. Meanwhile, the submission of the Gana report attracted many founding fathers of the party. Among PDP elders present at the occasion included former Minister of Finance, Mallam Adamu Ciroma; businessman, Chief Emmanuel Iwuanyanwu; former Jigawa State governor, Dr. Sule Lamido and Ambassador Aminu Wali. Chairman of PDP, Senator Ahmed Makarfi, said the party’s leadership does not want to be distracted by the plan of people who want to make PDP remain irrelevant. “We have been facing challenges. One of the ways evolved to hold PDP down and destroy opposition party in the country was to tie us down and make us irrelevant by using the court to tie us down,” he added. Makarfi said the party has realised its mistakes, which he stated include imposition of candidates and taking people for granted, which the report identified. He apologised on behalf of PDP leaders for these mistakes, and described the Gana report as “excellent”, which he added, would help in repositioning the PDP. Ciroma, who felt elated at the gathering of members of the party since PDP lost the 2015 general elections, said he was convinced that the party is still alive. “I feel very proud of being here. I feel proud of being involved with the PDP. I feel very proud of being one of the members who initiated the formation of this party. And I can say today that the party is alive and well,” he said. Iwuanyanwu, who dismissed the report that he has left the PDP, described the Jerry Gana’s report as a very important milestone in the rebuilding process of the party. Ahead of the 2019 general elections, the Chairman of the 85-member Peoples Democratic Party Strategy Review and Inter-Party Affairs Committee, Professor Jerry Gana, on Sunday, met with a former governor of Oyo State and national leader of the Accord Party, Senator Rashidi Ladoja, behind closed doors. Gana who was in company of the 2015 governorship candidate of PDP in Lagos State, Mr. Jimi Agbaje met Ladoja at Ondo Street Bodija residence in Ibadan and engaged in a meeting that lasted for three hours. The duo of Gana and Agbaje were received by Ladoja and his political associates among whom were Senator Femi Lanlehin; Barrister Bayo Lawal; Chief Bayo Lawal; Professor Tunde Ayeleru; Hon. Fatai Adesina; Mr. Nureni Adisa; Alhaji Bashir Lawal and Dr Nureni Adeniran. The visit came about two months after the governor of Anambra State, Willie Obiano, sent a delegation of the All Progressives Grand Alliance (APGA), led by Ambassador Bianca Ojukwu and a former Minister of Information, Labaran Maku, to discuss third force arrangement with Ladoja in Ibadan. It would be recalled that Ladoja dumped PDP in December 2010 in the wake of the division that tore the party apart in the build up to the 2011 general election in which he ran for the governorship of the state under the banner of the Accord Party. He noted that Ladoja and other democrats across party lines in the country needed to come together in the interest of sustainable democracy, peace, security and good governance in the country. “We are here to really convey our good wish to Senator Rashidi Ladoja who, though is a key leader in Accord, is one of the founding fathers of the PDP. We are touching base with genuine democrats, those who really wish democracy well in Nigeria. We have come with a very clear message that all democrats must unite,” he said. Asked if the PDP could attract leaders of other opposition parties to fuse into it in view of its leadership crisis, Gana said the crisis in the PDP was being blown out of proportion, saying that 95 per cent of the party’s leaders were on the same page. He expressed optimism that the pending judgment of the Appellate Court on the leadership tussle in the party would clear all doubts about the authentic leadership of the party. 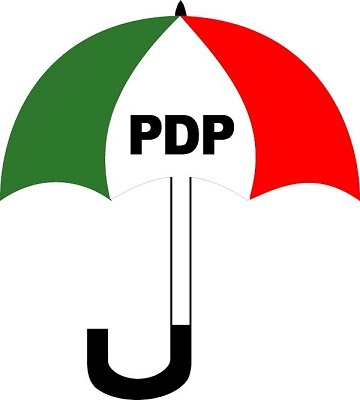 He added that the PDP would be re-invented after its committee submits its report and recommendations implemented, but declined to comment on whether the name of the party would be changed. Although the terms of reference for the committee were not published along with the membership of the committee in the newspaper advertisement published last week, it was gathered that the list of prominent politicians that make up the committee was indicative that the party was looking towards a re-alignment ahead of the 2019 elections. 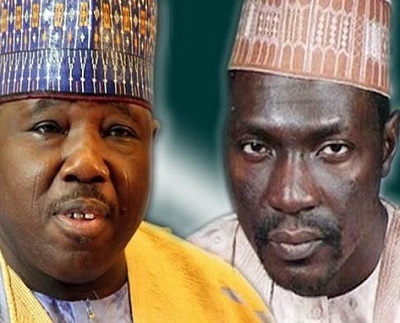 It was gathered from reliable sources in the factions of the party led by Senators Makarfi and Sheriff that both sides disagreed on the composition of the reconciliation committee and who will chair it. The Board of Trustees of the opposition peoples Democratic Party, PDP. yesterday may have eventually acceded to some demands of the embattled factional chairman of the party and former Borno State Governor, Senator Ali Modu Sheriff by disbanding the convention committee chair by the Rivers State Governor, Nyesome Wike, and also decided that the next convention of the party moved from Port Harcourt to Abuja. The two decision forms part of the conditions which embattled Sheriff had earlier given on the 9th August 2016, if there must be peace in the party. The meeting, which lasted about five hours, was described as stormy as members of the board insisted that the party must be rescued from the claws of its governors. The party had attempted to hold its national convention twice in the state, but was not successful. While the first convention which was slated for May 21 ended with the appointment of the national caretaker committee, the last one on August 17 was used to extend the tenure of the committee for one year. The party had planned to use both conventions to elect its national officers but the actions of the faction led by Ali Modu Sheriff prevented it. Sheriff, a former governor of Borno State, is currently in court contesting the leadership of the party. At the BoT meeting on Monday, the members also directed that a new national convention committee be set up. It, nevertheless, said the committee must be approved by the National Executive Committee of the party. With this directive, the board had dissolved the last national convention committee which was headed by the Governor of Rivers State, Mr. Nyesom Wike. The Chairman of the BoT, Senator Walid Jubrin, read the communique of the meeting. The BoT Reconciliation Committee headed by a former Minister of Information, Prof. Jerry Gana, agreed with the demand in its recommendations. The BoT communique read in part, “The next convention should be held in Abuja. Walid added that the BoT should facilitate the raising of adequate funds for the party, just as he urged the board’s reconciliation committee to continue with all good efforts for reconciliation. The BoT charged the committee to as soon as possible convene a meeting of the NEC to accordingly approve proposals for moving the party forward. The meeting, which started with 21 members, ended with 26 members as four others joined them before the end. Among those who were at the meeting were Adamu Waziri, Mike Ogiadome, Senator Ibrahim Idah, Dan Suleiman, Prof. Tunde Adeniran, Gana, Vincent Ogbulafor, Senator Ibrahim Mantu, Hajia Ina Ciroma, Senator Stella Omu, Alhaji Shuaib Oyedoku, Makarfi, Abdulkadir Kure and Chief Bode George. The crisis rocking the National leadership of the People’s Democratic Party (PDP) may have been resolved as the Senator Ahmed Makarfi led faction has conceded to the leadership of Senator Ali Modu Sheriff and has agreed that Sheriif should continue in office for three months to conduct a fresh national convention of the party and at a neutral venue. At a reconciliatory meeting in Abuja on Tuesday attended by some members of PDP Board of Trustees (BoT), led by Professor Jerry Gana, it was also agreed that the party’s National Convention be postponed from the August 17, 2016 earlier proposed by the factional committee and that; no fresh congress be conducted in any part of the country by the party but to rely on the earlier one conducted by Modu Sheriff. Modu Sheriff as the National Chairman also insisted that the date and the venue of the fresh convention must be set by all the party’s stakeholders and approved by its National Executive Committee. At the end of the meeting which ended on a convivial note, members of the reconciliatory committee agreed that the committee would reach out to all the Governors on the platform of the PDP to engage them to accept the resolutions. Earlier, the National Chairman of the PDP, Senator Ali Modu-Sheriff, said the rule of law must prevail for the party’s crisis to be resolved. According to him, the crisis lingered because leaders in the party were not alive to their responsibilities and keep perpetuating it. The much expected conciliatory meeting of leadership of the Peoples Democratic Party (PDP) with aggrieved members of the party took off on a shaky note last night at the Ondo State Governor’s Lodge in Abuja. The meeting originally scheduled for 8:30p.m did not take off as at 9.30p.m due to late arrival of expected participants. The meeting was expected to be attended by governors elected on the platform of the party, members of the PDP Board of Trustees (BoT), the PDP National Assembly caucus, caretaker committee set up in Port-Harcourt at the convention led by Ahmed Makarfi as well as the group loyal to immediate past chairman of the party, Ali Modu-Sheriff. Modu-Sheriff has refused to back down since his removal from office on May 21, at the Port-Harcourt convention, and has gone ahead to institute a court case against the party. It was gathered that yesterday meeting was particularly delayed because of the decision of Modu-Sheriff to stay away from the meeting as he was said to have jetted out of the country on Sunday night, a move being interpreted as deliberately taken so he could have tangible excuse to be away from the meeting. 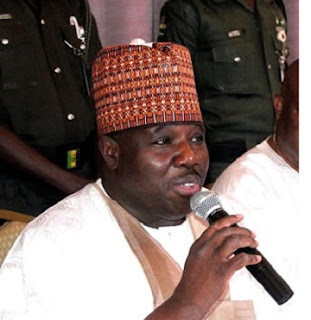 The governors were said to have been shocked to hear of Modu-Sheriff’s sudden overseas trip, given the fact that he was said to have assured the party leaders that he would be at the meeting. Modu-Sheriff camp is the only faction in the party resisting reconciliation as the Concerned Stakeholders group led by Prof. Jerry Gana has accepted to work with the caretaker committee. At the Ondo State Governor’s Lodge last night, it was gathered that the idea of postponing the meeting was mooted by some of the governors who were angry with the decision of Modu-Sheriff to jettison the meeting. The reconciliation meeting, it was gathered, was called principally because of his group. 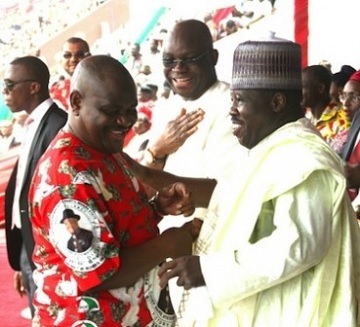 Senator Buruji Kashamu was also expected to be at the meeting as a supporter of Modu-Sheriff. However, a close ally of Modu-Sheriff told this newspaper that the angry former chairman has made up his mind to see through his court case against the party, as he holds on to his belief that he remains the national chairman of the party. “We are not aware of any meeting. Senator Ali Modu-Sheriff as the National Chairman of the party did not call any meeting, so it will be unwise of him to attend any meeting so called without his consent. 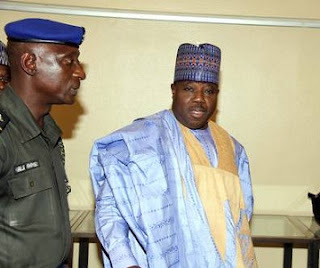 “Whatever decision allegedly taken by anybody or any group of persons at any illegal meeting will not be acceptable to the Chairman, he didn’t call any meeting, so, there is no meeting holding anywhere as far as Senator Modu-Sheriff is concerned”, the source said. As at press time, the vicinity of the Ondo State Governor’s Lodge was virtually empty as the governors were yet to arrive, but it was learnt that members of the Concerned PDP Stakeholders Forum and members of the BoT were locked in a meeting at the venue. The leadership crisis rocking the opposition Peoples Democratic Party, PDP took new twist today as tow of its lawmaker dumped the party and join the ruling All Progressives Congress, APC. Two members of the opposition Peoples Democratic Party (PDP) in the House of Representatives on Wednesday defected to the ruling All Progressives Congress (APC). The members are Tony Nwoye from Anambra and Udende Emmanuel from Benue. 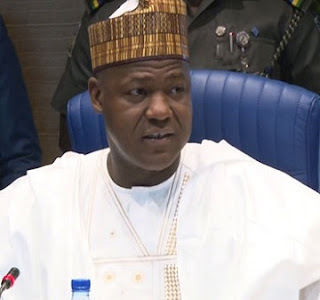 In separate letters read by the Speaker, Yakubu Dogara, on the floor of the House, the members cited division in the PDP as the reason for their defection. They said since the PDP had broken into three factions headed by Ali Modu Sheriff, Ahmed Makarfi and Jerry Gana, respectively, they did not wish to belong to any faction. However, the Minority Leader, Leo Ogor (Delta-PDP), in a point of order protested the position of the members alleging that the PDP was divided. He said that no recognised institution such as the courts had ruled that the party had split into factions. In a remark, Mr. Dogara said there was no need to debate the matter as the issue of the PDP would be handled at the national level. 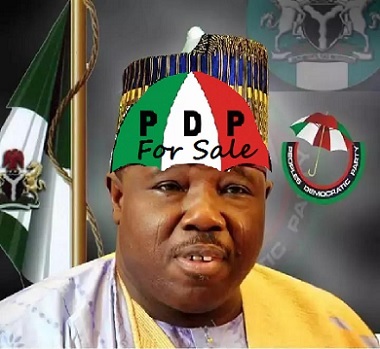 The ex-governor of Borno State, Ali Modu Sheriff has declared that he is still the authentic party Chairman of the crisis-ridden opposition Peoples Democratic Party, PDP, describing the conventions that reportedly sacked him as Illegal. Bwala said, “The chairman had announced the suspension of the convention based on numerous and conflicting court judgments. “He did that strategically in order not to embarrass the party and save it from further litigation. “Those that met and said they were doing the convention did that on their own. The governors have no role to play in the party according to our constitution. “Those who think they have money and that because of this they can run the party illegally will have to have a rethink. It was, however, gathered that the party might witness a series of legal action in the days ahead. On Friday, Justice Muhammed Idris of the Federal High Court, Lagos ordered members of the PDP not to take any action that would void the proceedings of court on the issue of the parallel convention. Also, Justice Ibrahim Buba of the Federal High Court, Lagos on Friday refused to vacate the order not to conduct election into the offices of the National Chairman, National Secretary and National Auditor at the PDP national convention. Report just reaching us suggests that Prof. Jerry Gana led Peoples Democratic Party faction, which held own convention at Abuja today has also postoned the election of the party national officers, but picked Ibrahim Mantu and professor Tunde Adeniran as the national coordinators of party pending the time a substantive convention will be held. The Port Hourcour version had also picked former governor of Kaduna State, Ahmed Makarfi and Ben Obi as the Secretary, News Punch had earlier reported. Reported monitored via Daily Trust Newspaper says, the former minister of information, Prof Jerry Gana-led faction of the Peoples Democratic Party (PDP), on Saturday, held a parallel national convention of the party at the M & M Event Centre, Abuja, ‎which shelved the elections of national officers of the party. The convention which ‎started by 10 am and ended by 12 pm adopted a former deputy senate president, Ibrahim Mantu and Professor Tunde Adeniran as coordinators of the party pending when the next national convention of the faction would be held. Although the date for their next convention was not announced, the convention also ratified a 57-member steering committee ‎that would administer the affairs of the party nationwide. A member of the steering committee, Chief ‎Dubem Onyia moved a motion that "in compliance with the court order, Mantu and Adeniran should run the party‎ until the next convention." Mantu and Adeniran were upheld as the co-chairmen of the party. Addressing the crowd, Mantu who enumerated the achievements of the PDP during its 16 years of ‎reign as the 'biggest party in Africa' added that the 16 years also led to mistakes that needed to be addressed by Concerned PDP Stakeholders in order to deepen democracy in the country. He said the stakeholder viewed the extension of the PDP national chairman, Senator Ali Modu Sheriff's tenure by the National Working Committee (NWC) as "null and void" as the National Executive Committee (NEC) cannot grant any such extension under the party's constitution. 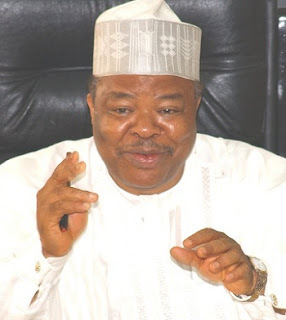 Mantu said NEC's appointment of Sheriff as chairman of the party was a "gross violation"‎ of the established procedure for the selection as Sheriff was not among the nominees sent by the North-east caucus of the party to the party's national leadership. According to the former law maker, Sheriff's decision to go ahead with the "illegal convention in Port Harcourt in disobedience for a valid court judgement stopping the convention" signalled a wearisome trend that would further weaken the party. He added that the Gana-led faction was aimed at rebuilding, renewing and re-branding the party to anchor the dreams of its founding fathers ‎and give wings to the hopes of citizens who "live in uncertainty and surrounded by a growing culture of fear." He said: "mindful of our role as elders and conscience of our great party, we the elders reviewing recent events‎ have come to the painful conclusion that the culture of impunity, disdain for democratic norms and utter disregard of our party's constitution, behaviours that brought us to the 2015 loss, are rearing its ugly head again.